5th in the league. Tight as tight could be at the top of the table; we were top two weeks ago until an awful run of fixtures has put a dampener on things. 6 points separate the top 6 teams, it'll be an interesting finale to the season. Just hope that we can come out smelling of roses!! 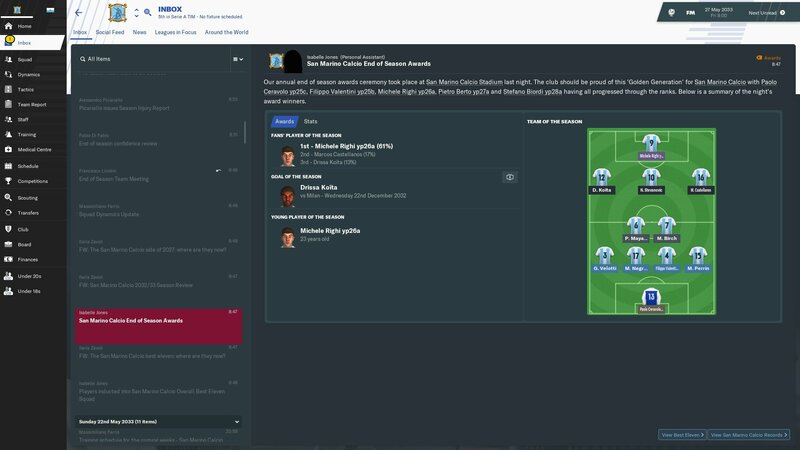 For the first time in three seasons, I've actually got a striker who knows where the goal is, and how to put the ball in it. Luca Male is on loan from Milan, but I'll try to loan him for next season already, and will put in a future fee if it's reasonable. Safe to say that he's been on fire for the first half of the season. I've started introducing my two Sammarinese prodigies, Albani and Reggini into the first team. They are obviously very young, but they're developing pretty nicely in training. Whenever there's an injury in midfield, Reggini comes in, likewise if Mele misses a match, Albani steps in. 5th March 2021 - Youth Intake Day. After the success of the last two years (5* potential ST and CM), it comes as no surprise that this year is underwhelming. A potential 3* GK is about as good as it gets. Expected, but still disappointing. What's worse, the personalities of my youth intake are fairly poor; 4 good personalities and 9 bad personalities. Awaiting better results next year because, well, they can't be worse than this!! Two games left in the season, three points clear at the top, promotion guaranteed. Our next opponent?? Verona, who are second. Beat them, and win the league. Simple. He says. Just a sidebar on how *awesome* Pellini has been for me. This season has been his best yet, but his possession stats are ridiculous. See for yourself. This is a tough group. Azerbaijan and Luxembourg should be a easy 12 points, Scotland we can take points off maybe but Poland and Croatia are going to be tough games. 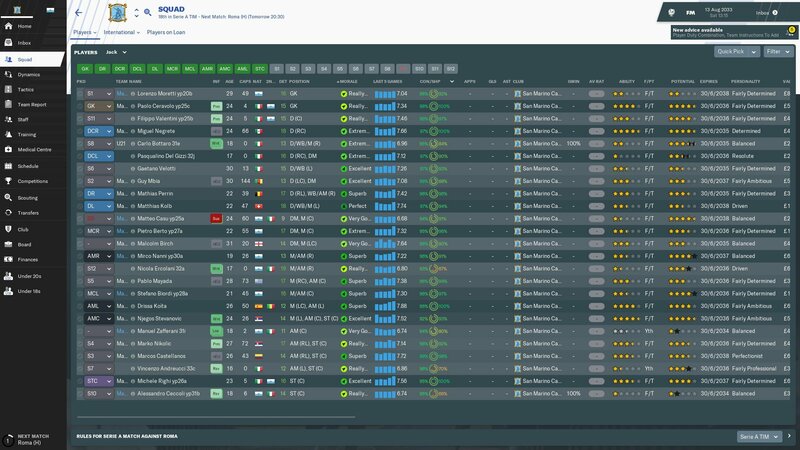 Polands first 11 have players from mainly the big European clubs and Croatia are a really good side. 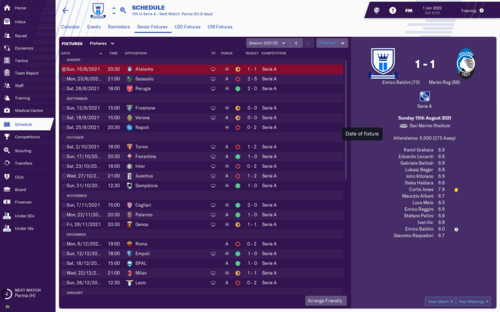 We finished 2nd in Euro Qualifying but I would be quite happy with 3rd in this group. 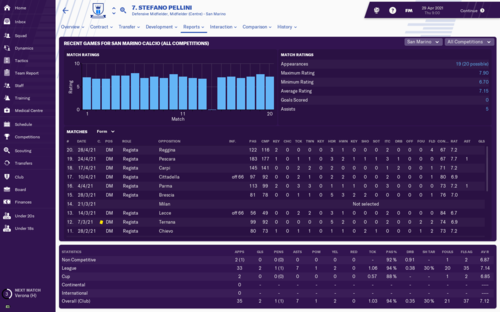 Stefano Fabbri 33a looks a decent little prospect. 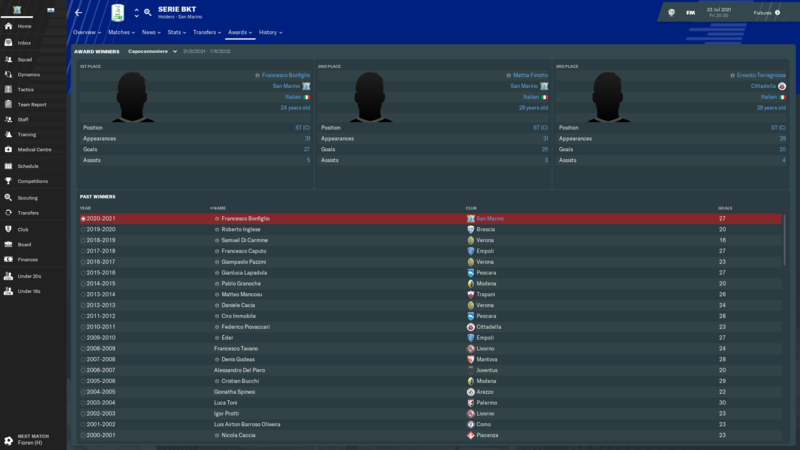 We have a couple of potentially good strikers who are dual nationality, but he is Sammarinese only thankfully. 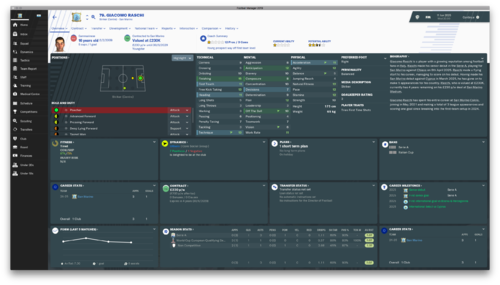 His personality and determination are rubbish so that needs some working on, but he will instantly become the player I look to develop next. We also have Giacomo Vannucci 33b who looks like someone we can develop, he not going to be anything special, but we need centre backs for national side. Victory against Verona ensured the Championship for the Titani. What a season!! Super excited for next season. Pellini absolutely bossed it. Averaging nearly 100 passes every match is ridiculous, especially considering he's been with me since Serie D. Under no illusions that next year is going to be a struggle. Need some key personnel, in addition to players. FORZA TITANI!! I dont think it would be exaggerating when I say this has been the clubs worst season for some time. 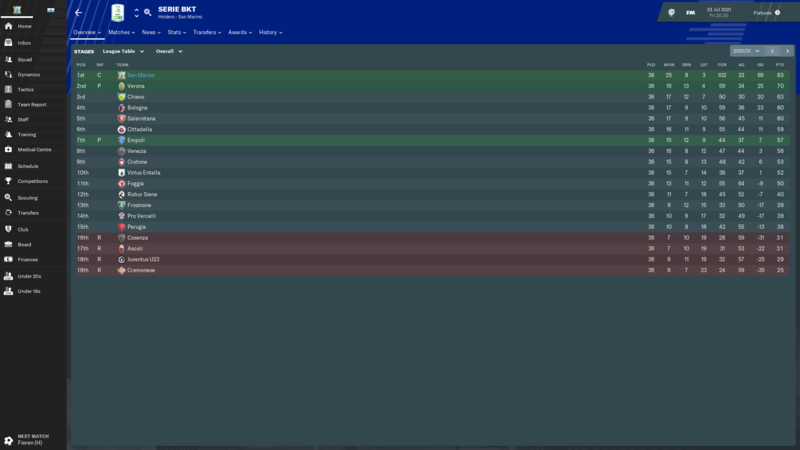 We imploded after the January break, and ended up finishing 5th, missing out on the Champions League. We also lost in every competition but the Club World Cup. 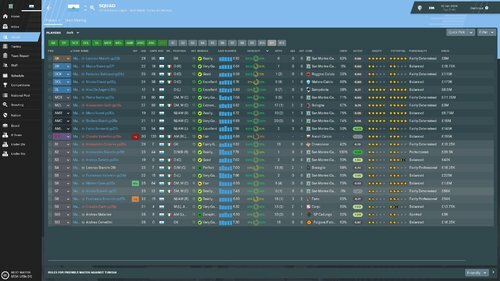 I really dont know what went wrong, we never had any long term injuries, or anything like that, it was just poor performances from some usually excellent players. Admittedly we haven't signed anyone for 2 seasons now, and that showed this season. 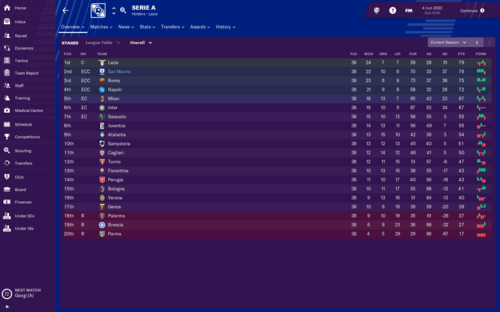 The only positives I can think that can come from such a poor season are Lower expectations next season meaning I can play some more youngsters without having to win the league and we never managed to win the Europa League so next season gives us a chance to add that maybe. I still don't want to revert to signing anyone, but if too many players want to leave due to the lack of Champions League next season then I may have to, just to avoid getting the sack. 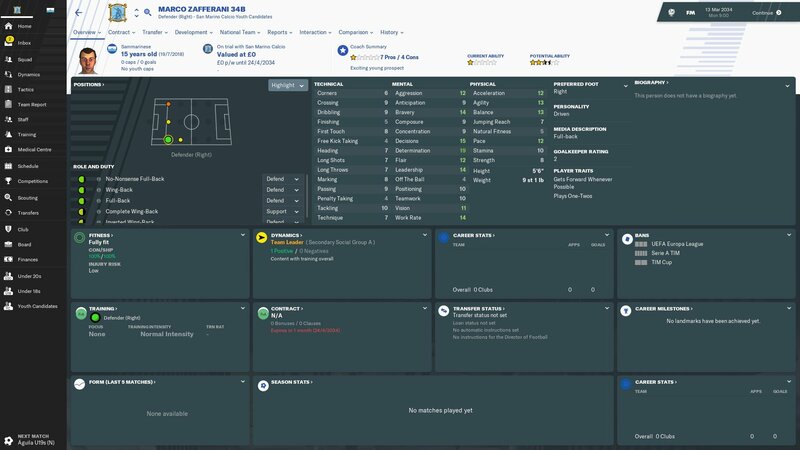 In what was a poor season Righi 26a won player of the season after hitting a career high 37 goals with 25 coming in the league. He has 87 goals in 145 games, sadly hes been capped for Italy and is lost to the national side. 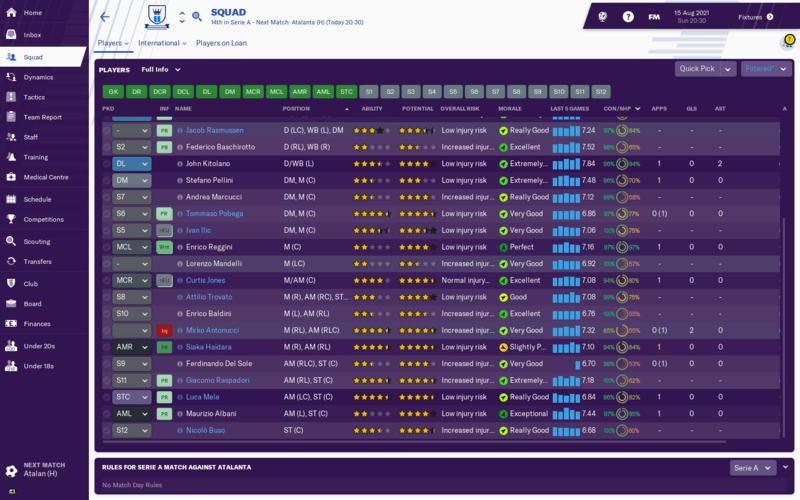 Interestingly thats basically our first 11 now with the exception of N. Zanellatto in the CM position. You can see Goal scoring GK Paolo Ceravolo 25c has scored 36 career goals. Aged 24, I should get another 10 years out of him, I would love him to get 100 career goals. He still isnt a lost cause as far as the national side goes, hes won 4 caps for Italy, but all have been in friendlies, he still refuses to switch nationality though so I kinda expect to never be able to play him. I am stuck in between two philosophy's for next season. Depending on the boards expectations, I may go as low as possible, maybe something like qualify for Europa League or something, get rid of a few big earners and promote the most promising Sammarinese youngsters into the first 11 and really focus on the development of players who can push the national side on. 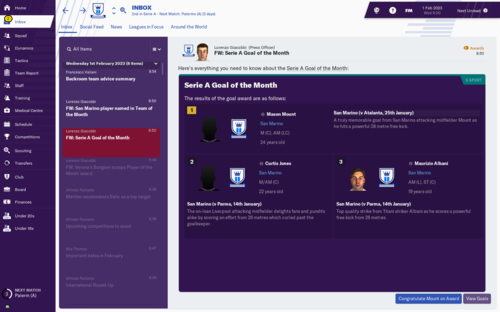 This is the one I am most tempted to go with, we have completed all the club side goals in the challenge after all. Or do I aim big and try to wrestle back the league, this will probably involve signing some new stars as we could do with them based on the way we flopped this season. We could do with a CB and with no real talent in the youth ranks, it wont exactly be stifling the development of any youngsters. @Lewis89 Great stuff so far, really enjoying to read your achievements!! Have you thought about trying the San Marino league?? That's my plan. I'm going to try to win Serie A, the Italian Cup and the Champions League with San Marino. 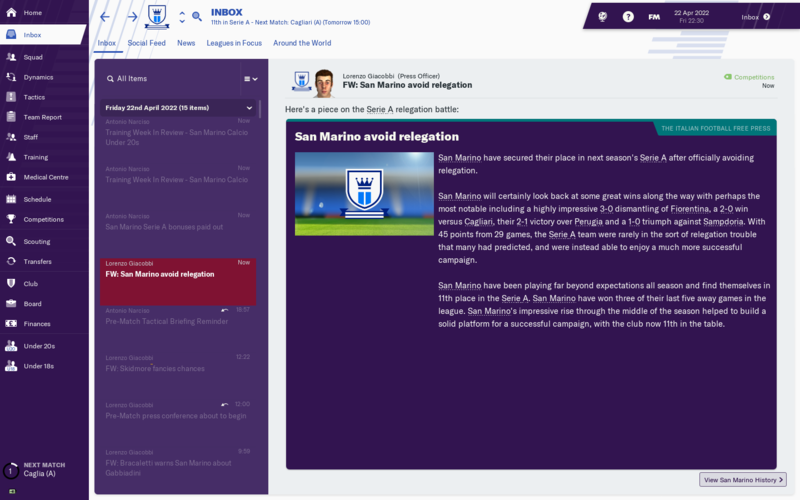 Once I've done that, or if I get fired, I'll be going to the San Marino League. Might help a bit more with the NT as well. cheers, enjoying reading yours and everyone else's progress. Its good there is a few of us doing the challenge. I did add a manager in about 5 seasons ago, took over San Giovanni in the domestic league, but where i started the save on the beta, the add on was flawed. The league was not generating any prize money or TV money and it has put me off managing there. 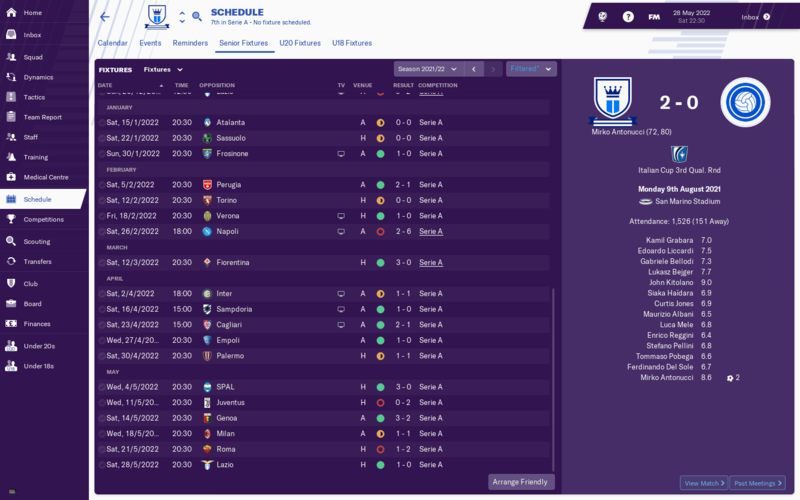 The domestic league has progressed massively though, ill do a little update on it in a moment. Have you thought about taking on the national team job yet? Not quite as low as I wanted it to be, but in all honestly, we should be challenging for the title, let alone just finishing in the top 4. 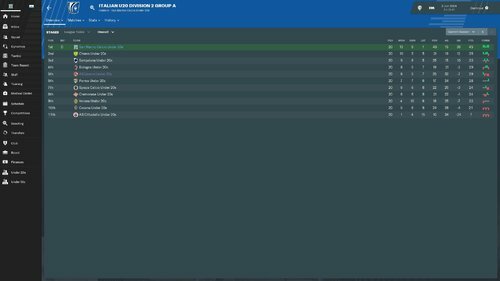 The bookies have us predicted to finish 2nd, although they are very rarely right on this game, it is a slight indication of how strong our squad is. 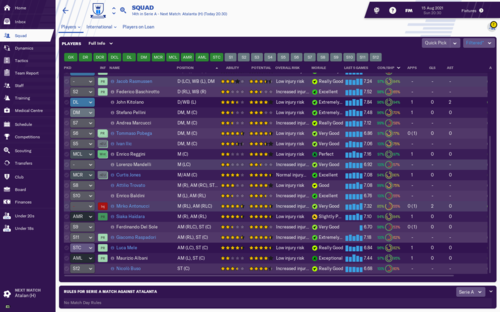 We sold a few back up players, but haven't lost anyone of any real importance. A couple asked to leave as they want to play in the Champions League, told them to stay and we will qualify, they agreed to stay. 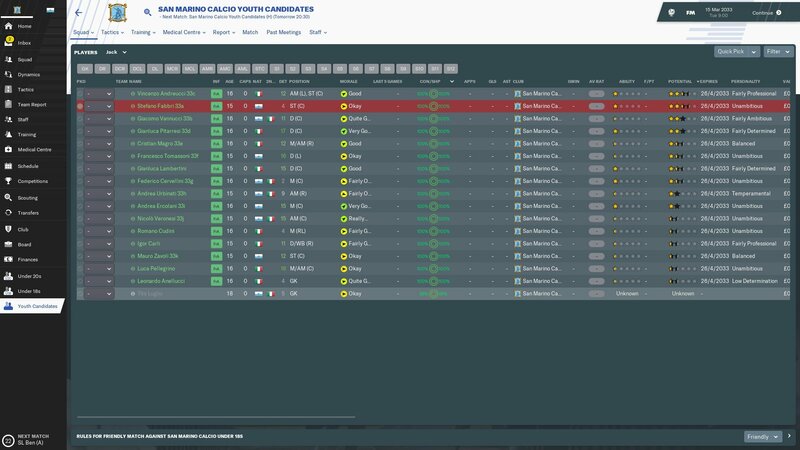 We have however promoted a few youngsters from the youth sides. We have a total of 14 HG players in the first team, with 8 being San Marino eligible, 2 having already been capped by Italy, and 3 Italian only HG players. 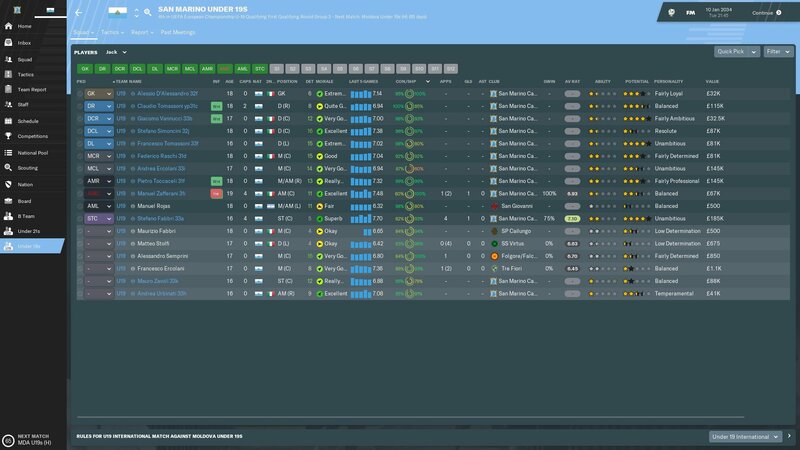 We did also make 1 signing, I needed a back up keeper, and former youth product Lorenzo Moretti 20b was stuck on the Napoli bench. I thought rather my bench than theirs. The aim through the save has been to retain any San Marino eligible players, and even if they are not good enough for the first team, to then get them loaned out to teams so they can play first team football and possibly develop as much as possible. That way they are match fit for when the national side has games and obviously means better players for the national side. 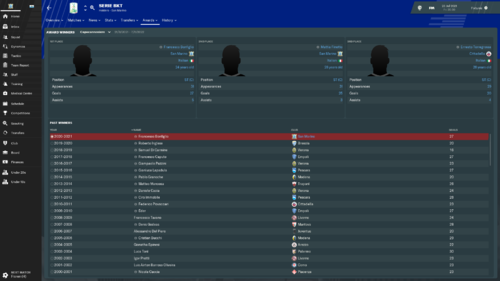 The best 2 of the bunch are LB Alex de Angelis 32b and ST Riccardo Stefanelli 31a. 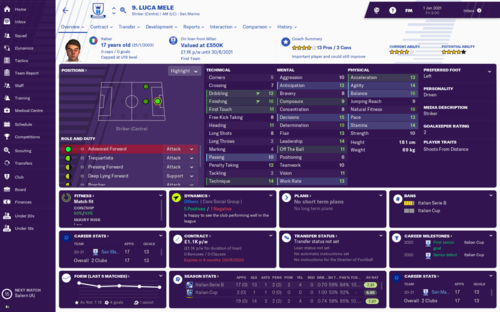 On loan at Sampdoria and Fc Bari, both have been promised roles as key players, so for their personal development, they should both be very good loan moves. Steffanelli 31a has so far refused a call up with the hopes of playing for Italy, De Angelis 32b already has 6 caps and will be a fixture in the National side for years to come. We are just about to start the 16th season of the save, so thought i'd have a look into the domestic league and see how its progressed in the 15 years. Ranked 85th in the European League Rankings is pretty good considering when the game starts its around the 200 mark. We have 2 new stadiums at 5000+ seats and SP Cailungo are due to move into a 7000+ seater in 2034. The league has 3 professional sides, 8 semi-pro sides and 4 amateur sides. No team has yet to qualify for a group stage of any European Competition as yet though. 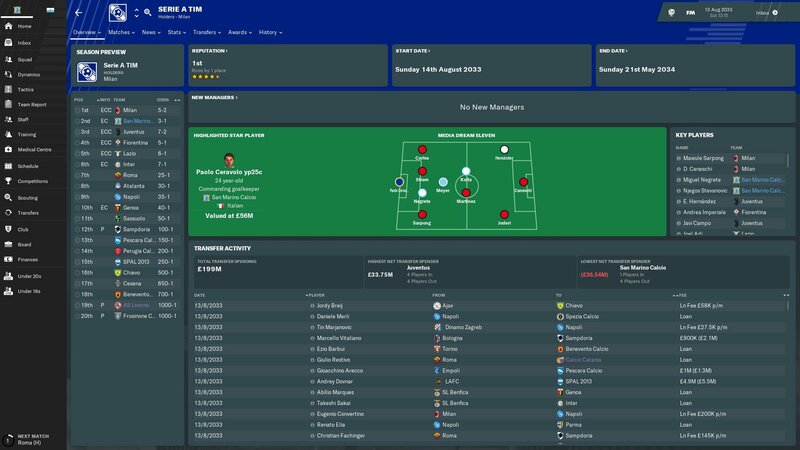 15th August 2021 - The start of our Serie A campaign. 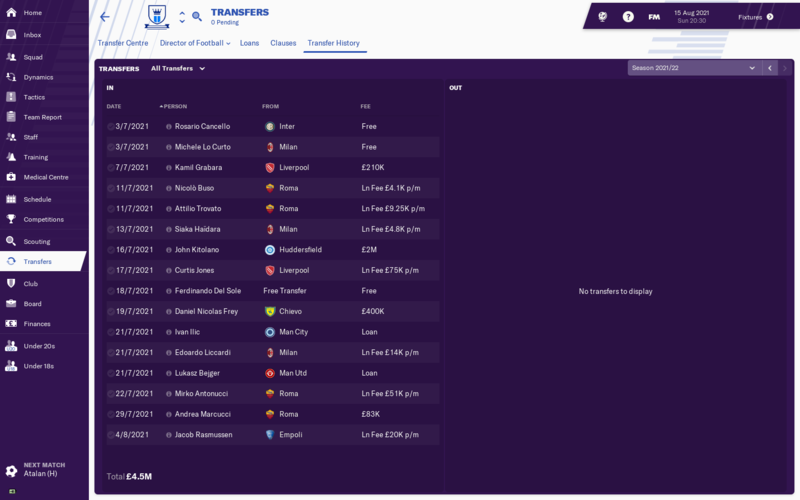 We've had a fairly busy transfer window, and thankfully just under half of my transfers are permanent transfers, not loans. Still too many loans for my liking, but within a couple of seasons (providing I'm still in the hot-seat), we'll be loan-free!! Half of the team are San Marino players, and half of them are on loan in a squad of 28, and so I'm looking to cut down to 10 loans next season and 5 the year after, until we're self sufficient. Living in a dreamworld; maybe. Finally, I've decided to throw Albani and Reggini, my two Sammarinese prodigies, in at the deep end in Serie A. I'm training Albani as AML-Winger Support to help his versatility, and because Mele was unstoppable last year as my lone striker (managed to keep him for at least another year, which I'm elated with). Reggini is operating as a Box-To-Box Midfielder alongside Curtis Jones (on loan from Liverpool - always had great success with him) as Advanced Playmaker - Support/Attack depending on who we play. Pellini is keeping has place at the base of midfield even though Ilic (on loan from Man City) is a better player; Pellini is just getting better and better year after year. It's going to be a tough season, but I'm expecting us to beat relegation fairly easily. A minimum of 8 points from the other promoted teams will give us a platform to work with. 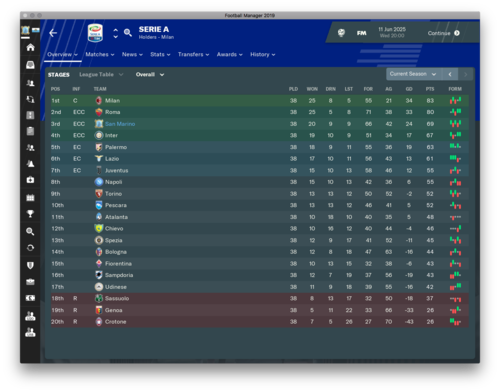 11th in Serie A, out of the Cup in the 4th Qualifying round. I'm not too disappointed with where we are in the league, and I'm not too bothered about the Cup right now. Bigger fish to fry!! We've won as many as we've lost in the league, and thankfully haven't drawn too many games; much rather a win and a loss than two draws. We definitely seem safe enough at the moment, but still I'll be looking to make more inroads. Very disappointed with my attack this season. Top scorer is Haidara with 4 goals, which is nowhere near good enough. Still have plenty to do to avoid relegation, but the earlier we can make that happen, the happier I'll be. 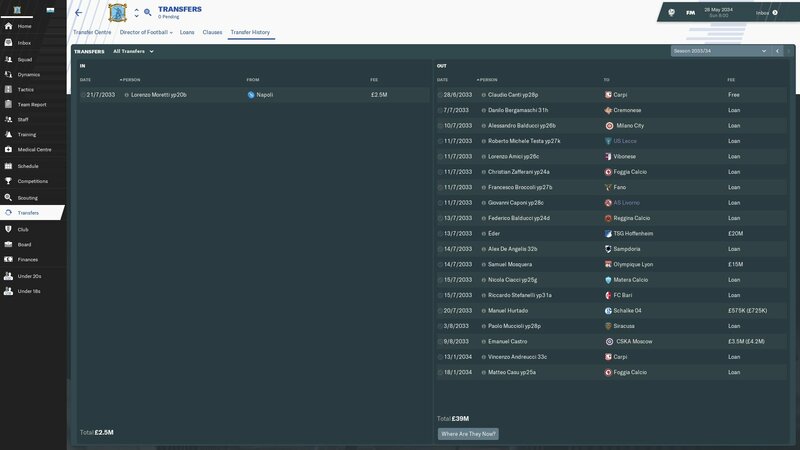 7th March 2022 - Youth Intake Day. Aside from the one player, this is another poor intake. I'm not even expecting Nanni to tear up any trees, but he'll be good enough for the San Marino national team. At least for a long while. 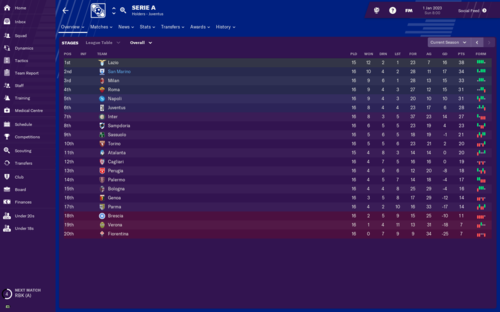 In terms of progression, 11th in Serie A on 38 points after 26 games played. I feel like relegation is all but avoided, and so I'll be turning my attention to next year earlier than expected. Most players that I target aren't going to be interested yet, and I don't have any money anyway (like at all), but I'm looking to cut down on the loans, so my targets will be contract expiries and relegated stars. Success!! With the right results going for us in the league, we've managed to secure survival with 9 games remaining. Thankfully Albani, our Sammarinese prodigy, has really stepped up to the plate in the last few weeks, and decided to act like a striker and score some goals. 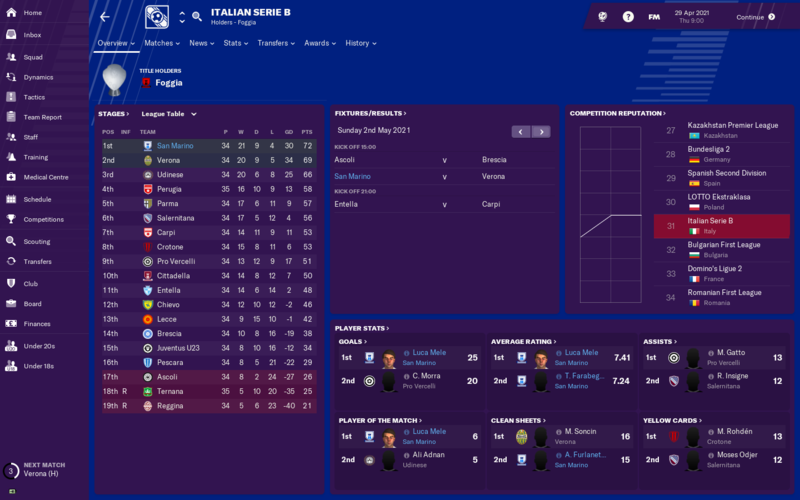 With Grabara keeping plenty of clean sheets at one end, and some vital goals at the other, times are good at San Marino. Our next four games are against 16th, 20th, 15th and 19th, so hoping to pick up as many points as possible before facing Juventus, Genoa, Milan, Roma and Lazio. Very glad to not be in a dog-fight. We'd never survive. San Marino isn't an option to take over as an International Club. Where am I going wrong? When setting up the game. 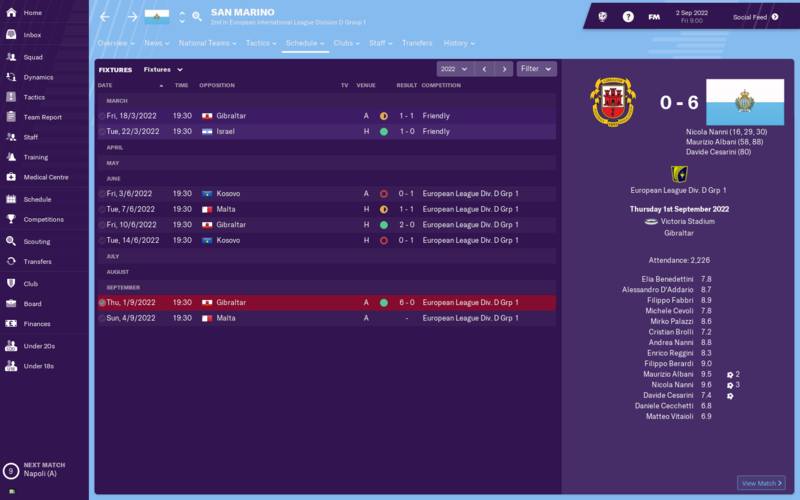 You need to go to advanced options and select all players of nationality for san marino. 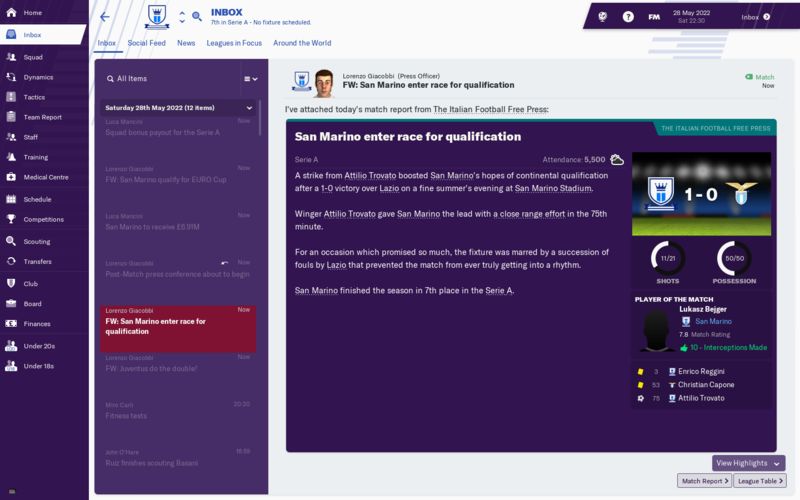 The San Marino challenge entails taking international football minnows San Marino to the top with a World Cup victory. This seems impossible however San Marino has an ace up it's sleeve. 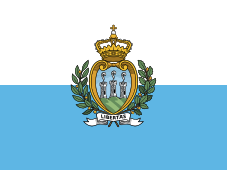 San Marino Calcio is a club based in San Marino that plays in Italy's Serie D. Getting this club promoted to Serie A and investing heavily in youth facilities, junior coaching and youth recruitment should see higher quality Sammarinese players produced leading to a better national team. 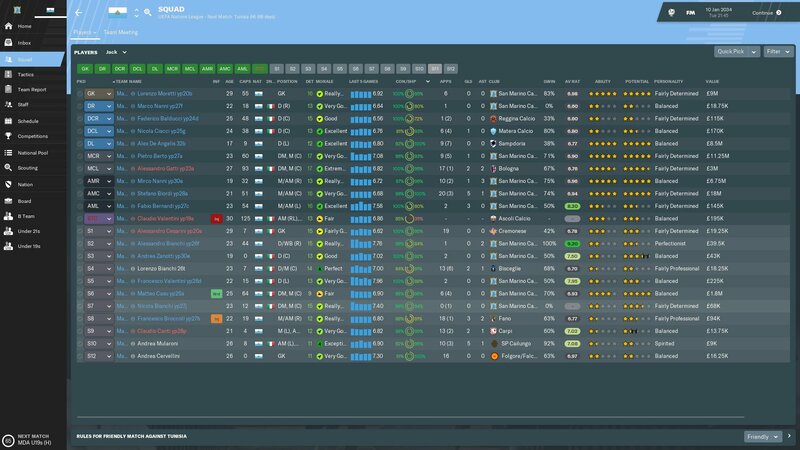 Serie D is not in the original game database. To be able to take control of San Marino Calcio you MUST download an editor file which includes Serie D. This is the one I have used but I cannot vouch for its quality as of yet. There are multiple ones on the workshop you can use, I don't know which work perfectly. 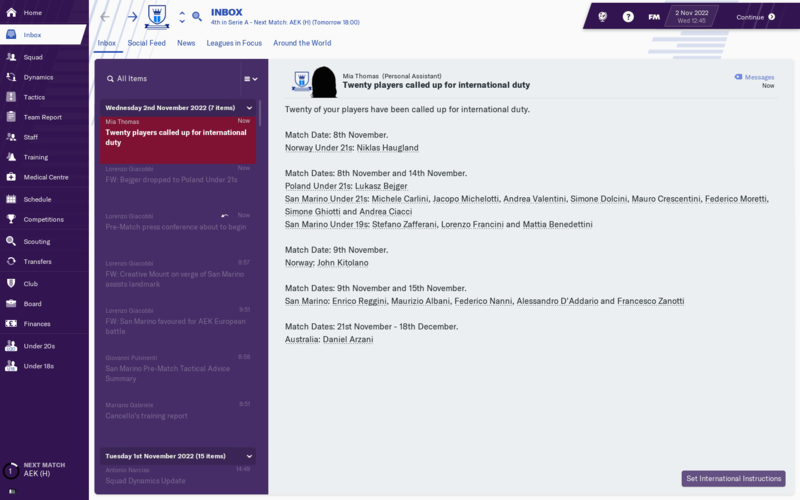 To have the option to manage the San Marino National Team you MUST select custom for database size and then go to nations, San Marino and make sure "load all players of nationality" is ticked or you'll be unable to take control of the National Team. 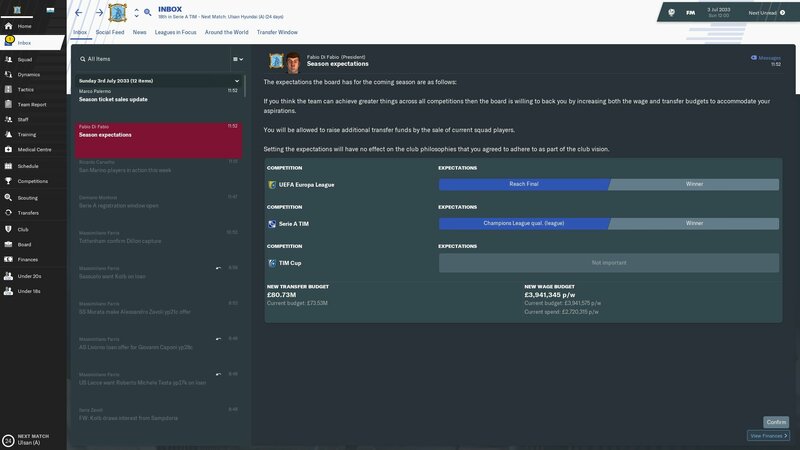 Must be done when selecting leagues at the start of the game. 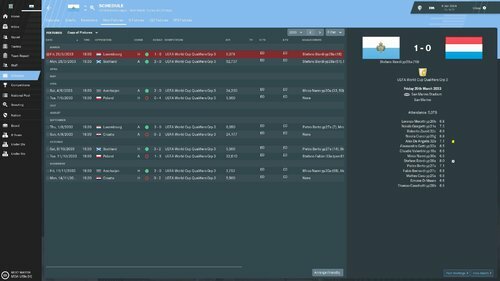 Do not cheat with the use of ingame editor, genie scout etc. Spoils the achievement. That is all, hopefully some of you decide to take up the challenge, it's a long one! @potbellypigs the bit in bold explains it better than i just did. 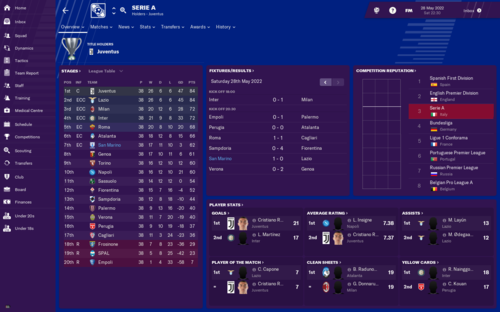 The season is over, and we managed to secure 7th place in the league. 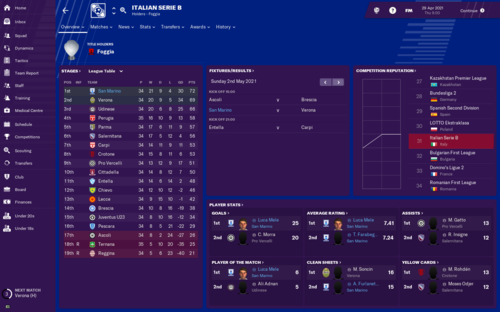 Last match of the season against Lazio was pretty special as we ground out a 1-0 win, and denied them the Scudetto (that went to Juventus. Again). By finishing 7th, we managed to qualify for the Euro Cup, which is a phenomenal achievement considering we were supposed to be relegated. 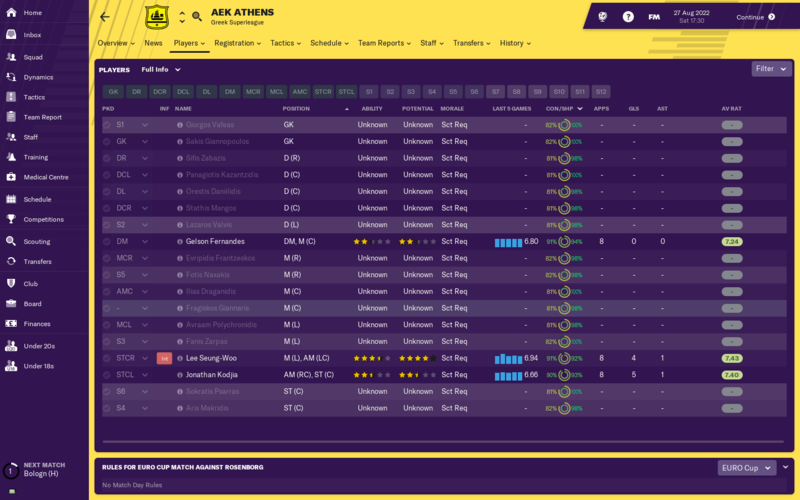 Looking forward to next season, I'll be cutting down on the loans that have served me so well over the last four years. I asked the board for some new training facilities and a new stadium, which will be very exciting, and give us a bigger source of revenue. It's been a wonderful year for us, and I'm just hoping that we'll go from strength to strength. It'll be much more of a challenge squaring up against the big boys, but Know that we can do it!! If we defend as well next year as we did this year, we'll be a real force to be reckoned with. 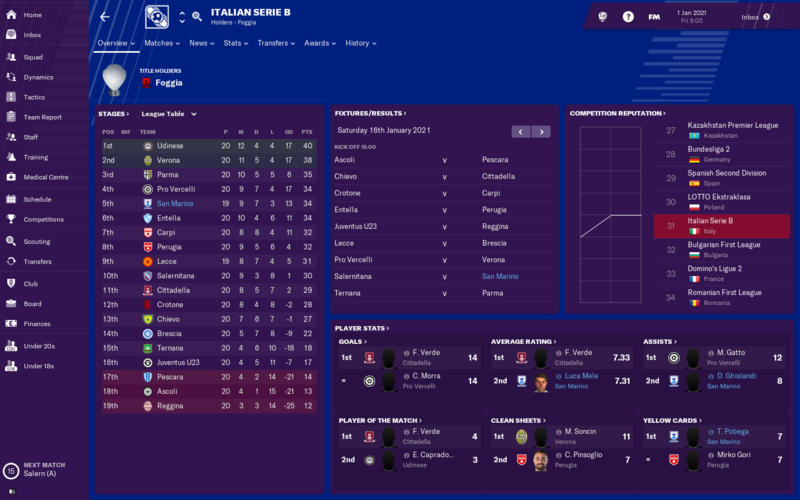 It's the start of our second Serie A campaign, and we're in a much stronger place than last year. We've actually already played a couple of Euro Cup games; the Second Qualifying round against Cork City, whom we beat 3-0 over two legs. We've got Young Boys next, so that will show me what we've got. 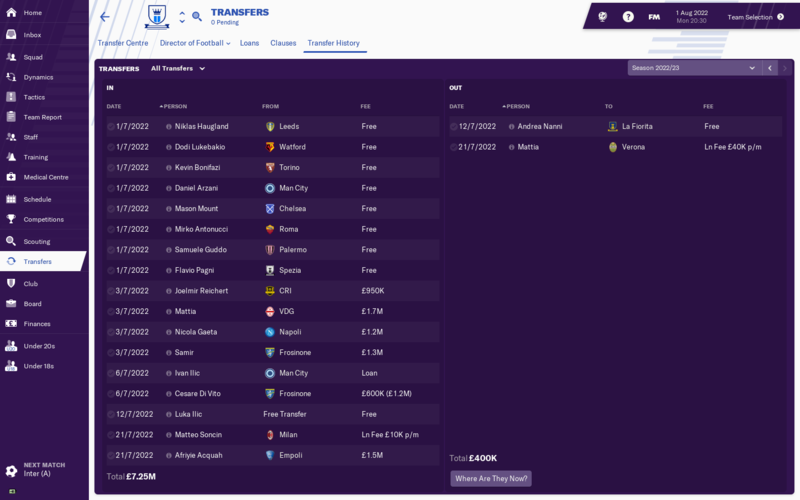 I'm really happy with the work that we've done in the transfer market. 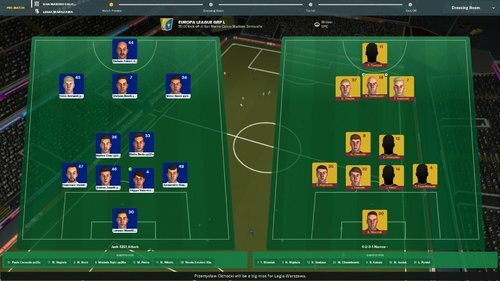 We're down to five loans, and only one of them, Curtis Jones, is in my starting XI. As soon as Mattia comes back from loan at Verona, he'll go in his place. Trying to loan out Joelmir Reichert as well, but no-one wants him which is annoying from a non-EU registration point of view. Mason Mount coming in is a huge coup for us, alongside Samir at the back and Daniel Arzani on the wing. I'm fairly confident of a decent campaign, although we're tipped for relegation!! So, our team sheet looks strong, and we've got the depth for a long season, and I'm keeping faith with Reggini (who I'm playing at the base of the midfield), and Albani up top. They're definitely benefitting from training and first team games. 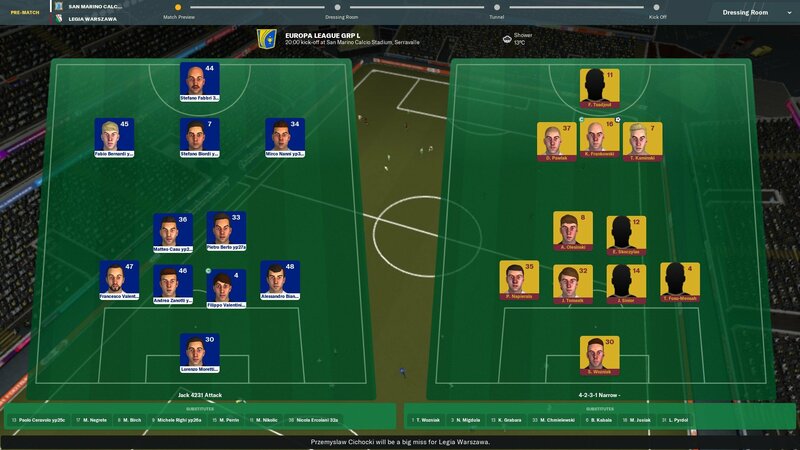 We managed to navigate Young Boys easily, winning 4-0 on aggregate. 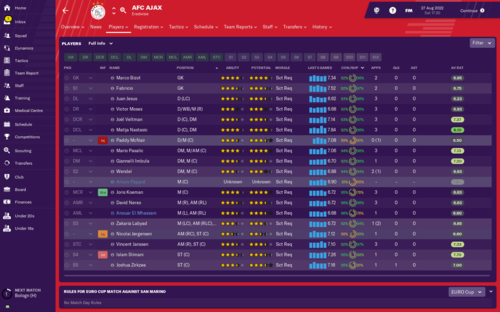 Now our next challenge is making our way through a group that consists of Ajax, AEK and Rosenberg. Looking at the teams drawn in our group, I'm quietly confident of our chances. 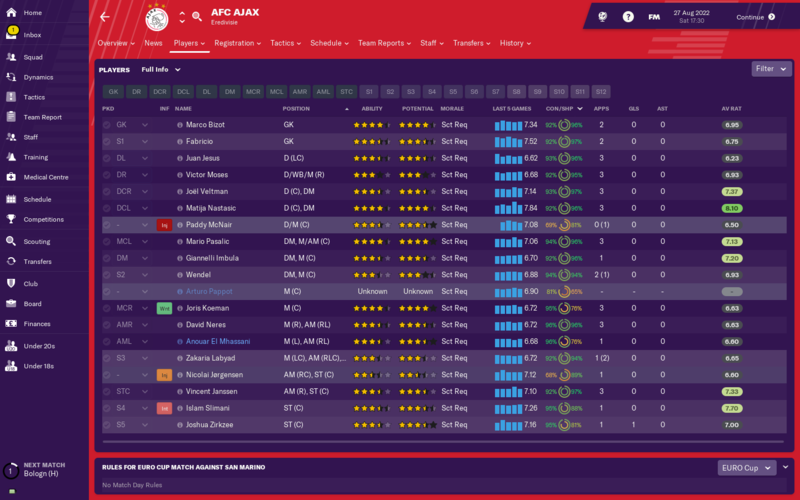 Ajax are a good team, and will be our main threat in this group. They've got Matija Nastasic at the back, and David Neres on the wing, so they've got some class acts in their squad. 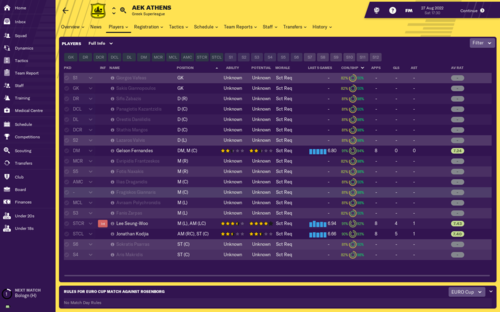 Rosenberg shouldn't prove a huge threat, and the same for AEK. I'm hoping/expecting for us to finish second in the group, but if we show up against Ajax, could we top it?? I sure hope so. Andy Selva, RIP. His long standing record of 8 international goals is broken, but unfortunately not by a San Marino player, but Nicola Nanni. All bets are off, but I foresee Albani overtaking him in the future. 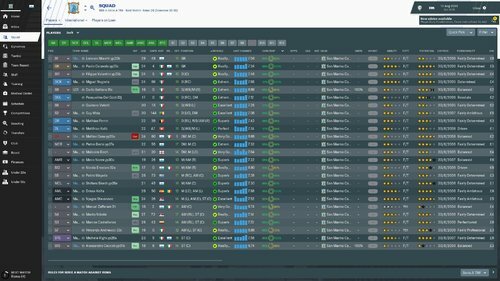 The National Team looks pretty shabby, but is actually performing quite well. Albani and Reggini are mainstays, and Nicola Nanni is scoring plenty of goals (grr), and I'm sure it won't be too long until Federico Nanni (from the last youth intake) will be starting next to Reggini in the middle for La Serenissima. We have just managed what for me is a huge milestone along the way to completing this challenge. After our dismal collapse last season left us with only Europa League football to play this season, I knew our squad was going to be way too strong for the group stages of said competition. So from the out set, I was going to use these games to give back up players and promising youngsters some first team game time. Having done so for the first 4 games (4 wins), on the 5th game I decided to field a full HG Sammarinese 11, and to devastating effect. 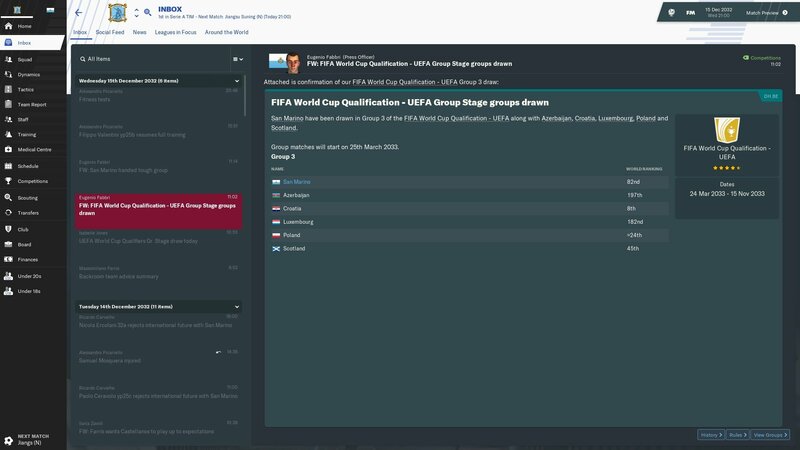 As mentioned in my post just after the draw I knew we had little chance of qualifying from this group and we eventually achieved the aim of 3rd place. Luxembourg and Azerbaijan were easy games, whilst the 2 wins over Scotland were big results for us. In the end, Poland and Croatia were just too strong though. I am satisfied with this, and feel we are only a few players away from a real shot at qualifying for a finals. Its a good team, but there are some major flaws. 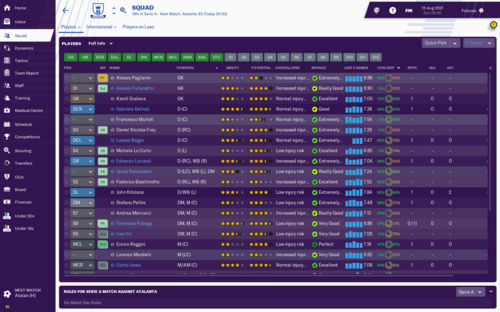 The defence is not the best, and we could really do with some star quality up front. 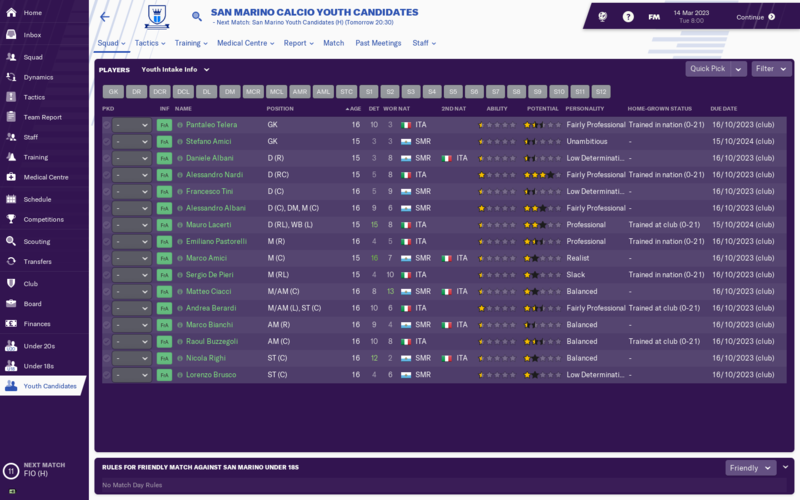 Our midfield is pretty solid, with Biordi 28a, Gatti23a and Berto 27a all excellent players. 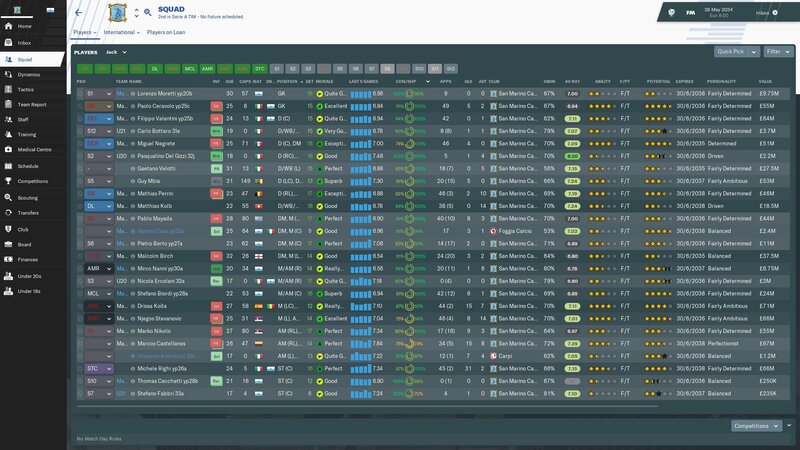 This has always confused me, we have not played that formation for about 2 years now, so not sure why the best 11 is set that way. We play a 4231 with a Cam., and somehow our cam is only on the bench, even though he has been immense for us. Mirco Nanni 30a was my pick of the bunch. 10 games, 4 goals for the exciting 19 year old winger. He is really starting to flourish now, and he will be a star of the future. Again a formation that hasnt been used in years. In one of the most frustrating moments of the save so far, defensive stalwart Nicolo Giorgetti 21a (117caps) decided to retire from international football at the grand old age of 29. This is a huge blow for us, he was by far the best Cb available, and with no other real quality there at the moment, we need to develop someone to replace him. 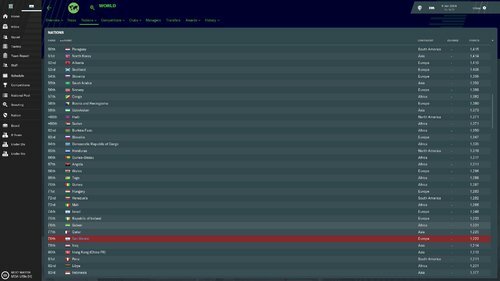 Currently sat 78th, sandwiched between Qatar and Iraq, I feel this is pretty harsh, but then the highest ranked side we have beat is Scotland whoa re ranked 53rd. Maybe some friendlies against sides in the top 50 would help. 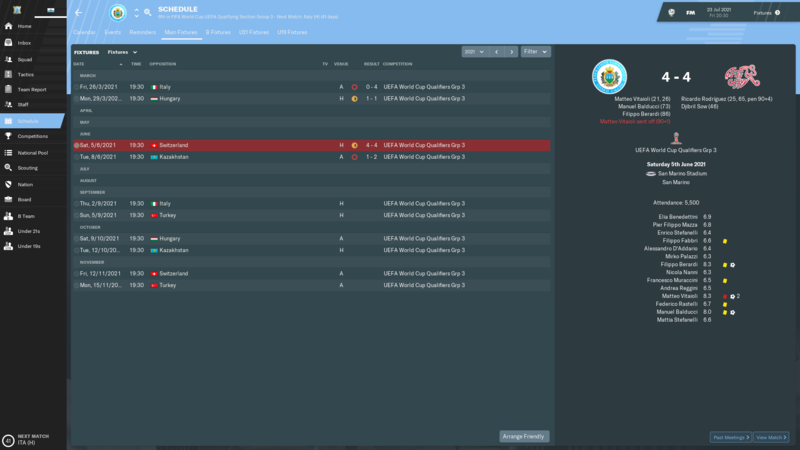 I have decided to take full control of the U21s and U19s. We are 16 seasons in and both sides have failed to qualify for any major finals. We haven't even came close yet and I think that's got to change if I want any real success at senior level. 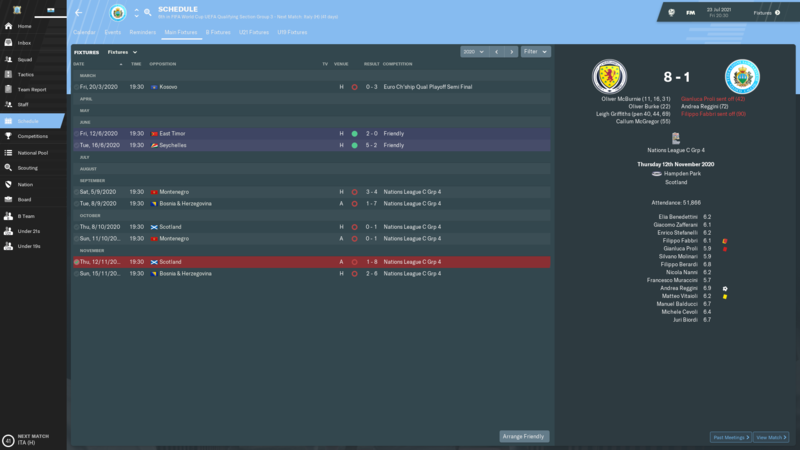 I am also taking charge of the club sides U20s side to try and push this on abit further. What prompted this was after another dissapointing campaign, the u19s boss resigned and rather than look for a new manager, I thought id give this a try. 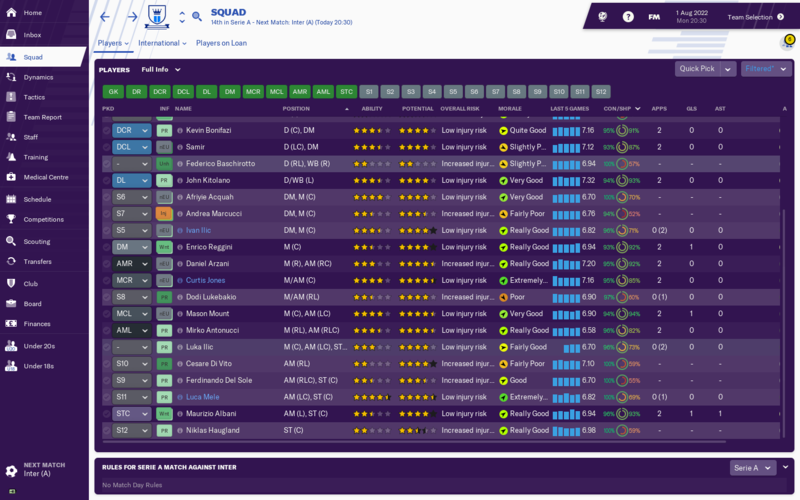 Then realised the u21s would be taking mostof the players I wanted to use for my first game so have decided to pick all 3 squads. 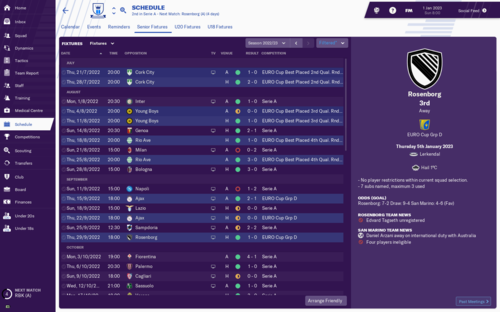 I will be using the IR button for these two sides games, but am hoping to try and bring through a group of youngsters that will eventually star for the senior side. now im not overly sure if its the right time to do this, as we are not blessed with the greatest crop of youngsters atm, I just feel we should be doing better than we at this level. And by taking charge of the club sides u20s, can try to build a squad mentality throughout the teams. Fabbri 33a is the best prospect not currently in the senior team, and even though he has scored 3 in 4 for seniors, is going to be dropped back as he is still very raw. Federico Nanni has been called up to the senior San Marino National Team. It's almost like it's beginning to take shape; one striker at Serie B level, one centre midfielder at Serie B level, and one centre midfielder at Serie C level, and all under 20 so have plenty of room to progress. Still plenty of a ways to go though. 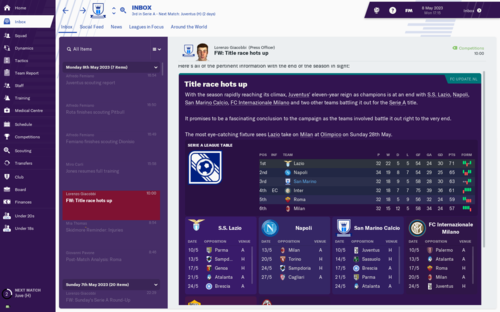 I'm hoping to complete my achievements in Serie A quite quickly so I can have some fun in the San Marino domestic league. Maurizio Albani. Nominated for European Golden Boy?! He'll never win it, but kudos to the kid for earning that recognition. 16 games played and 2nd in the league. Things are going really well for us, but I'm sure that they won't last. We've only played five games of our Euro Cup campaign (stupid World Cup in November), and that's our next match. We started off the season ridiculously well in defence, and in October we were just excellent. Mason Mount, Curtis Jones (still on loan from Liverpool) and Maurizio Albani have just been scoring plenty for fun. Nicola Gaeta, DR, 27 apps, 1 assist, 94% tackle rate at 1.84 per match, 85% pass success rate, 1 POM at 7.24. It's taken two seasons but I seal promotion into Serie C, and get a new record goalscorer! 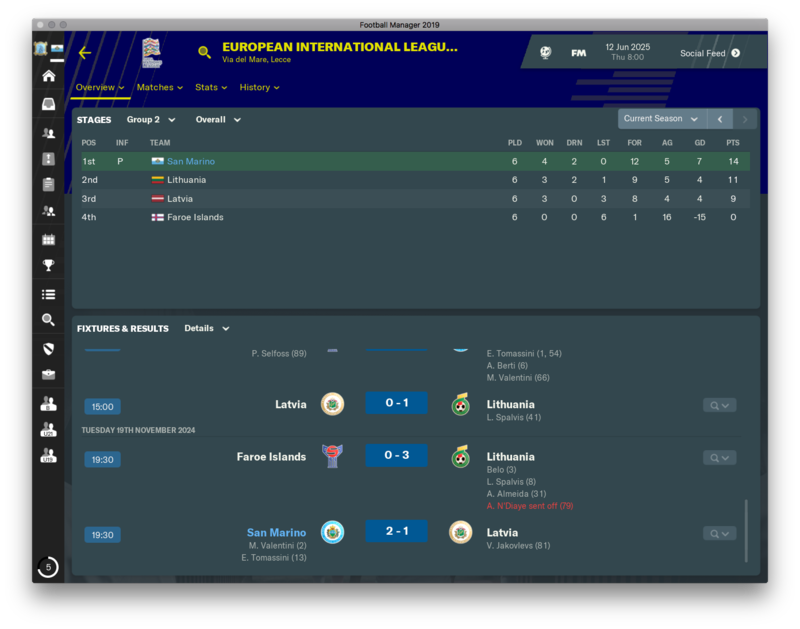 We won our NL group and had to play against Lithuania and Armenia in the playoffs. 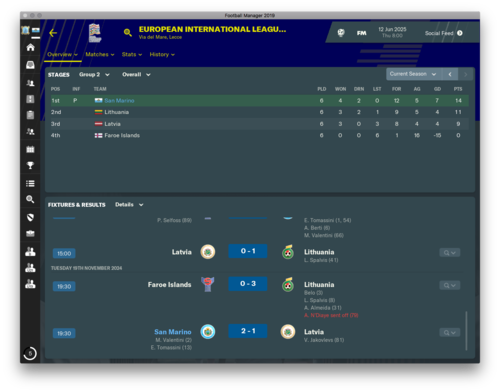 Won 3-0 against Lithuania and 1-0 against Armenia. 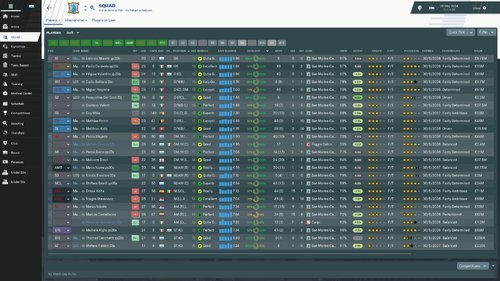 It's youth intake day, and it's a bit upsetting. We do have a fairly decent prospect in Alessandro Nanni, but he is Italian, and not Sammarinese, or even dual nationality, which is no good for the San Marino national team. Due to the World Cup being in November this year, there was only one Knockout game in the Euro Cup second round. 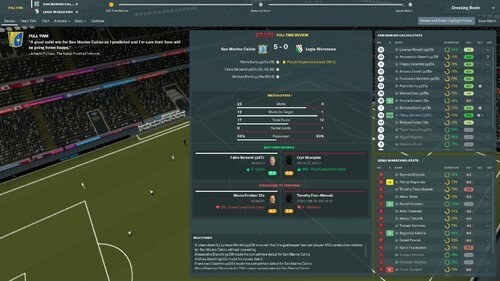 We drew 0-0 against Everton, and went out on penalties. It's such a shame as Patrick Vieira was goading us, and I wanted to shove it down his throat (especially being a huge Liverpool fan personally!! ), but as soon as it came to penalties, we were doomed. We're awful at them. Just started this one. Currently unbeaten top after going unbeaten in my first 6 games. Will provide a proper update at the end of the season. Quick Question: Do I get added to the hall of fame for this? 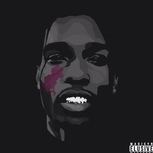 I believe that you have to be added by @rycl77for that. Looking to be added to the Hall of Fame myself!! 6 games left in the season It looks like it could be a proper shootout, but I think that Lazio are the favourites. 6 points clear with two games in hand is remarkable. We've done really well this term, and being in third so late in the season is a brilliant achievement, but we've been so inconsistent the last three months. Juventus have really fallen off a cliff this year. They're in 7th, and have lost 9 games in the league. It's been refreshing, especially as they've won the league 11 years in a row. Champions Cup, here we come!! 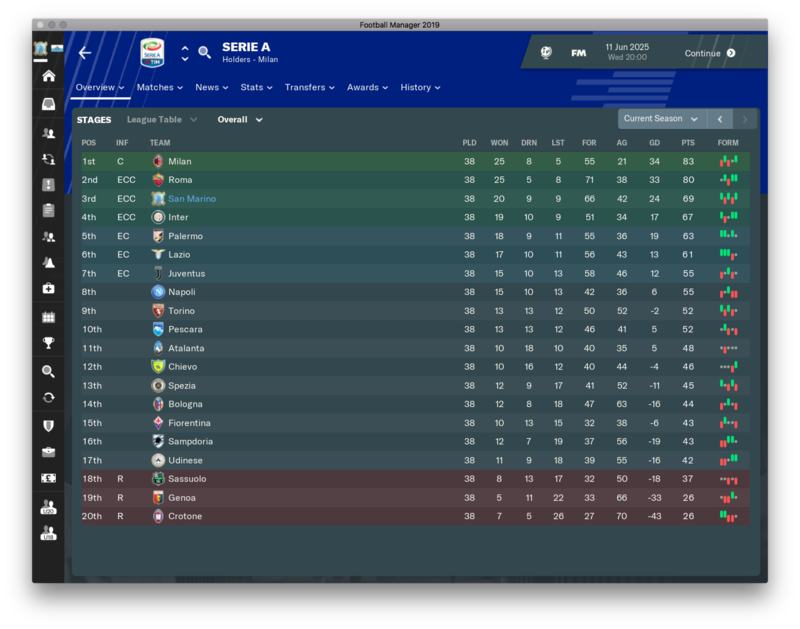 We're guaranteed a spot in the Champions Cup, but there's still an outside chance of us lifting the Scudetto. Lazio have taken two points from their last three games, which is good news for us. We're still three points behind them with two games left. The season is over, and we secured second with a game to spare. 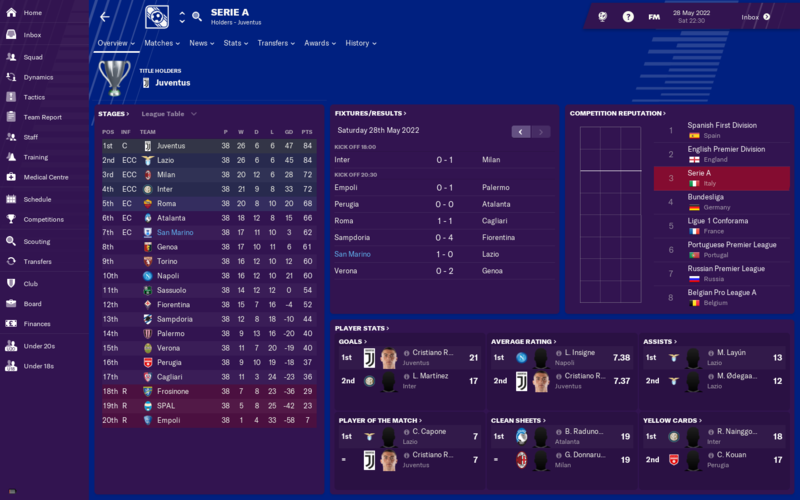 Lazio won their game after we won 3-0, and won the Scudetto based on the scores between us; 0-0 and a 2-1 loss. I'm mighty proud of how our team has played. Mason Mount was ridiculously good for us, and Maurizio Albani finally found his shooting boots this season. 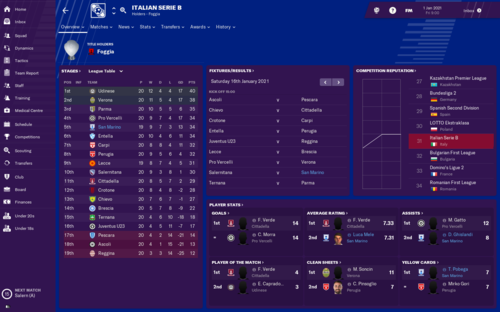 The challenge for next season is sustaining our upward momentum, and getting the right players in so that we can balance the league, the Champions Cup and, this year I'm actually going for it, the Italian Cup. I'm looking to strengthen a couple of key positions. 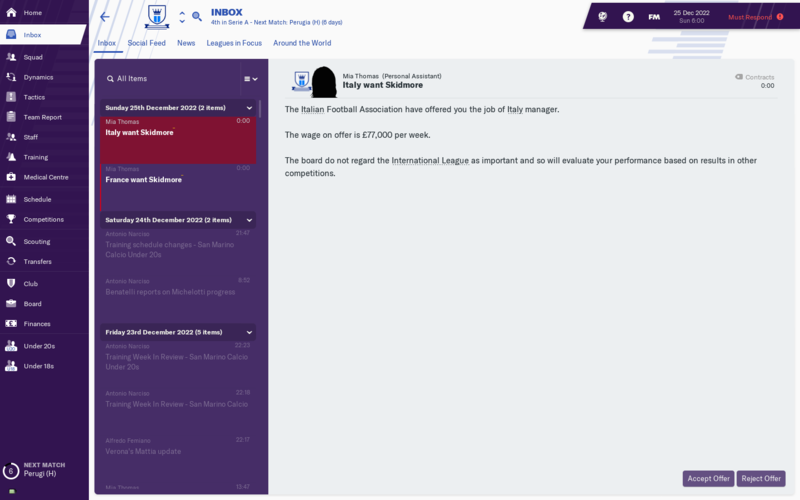 Even though Grabara has been a great servant over the last two years, with Fiorentina in turmoil for the majority of the campaign (they didn't win in the league until January. Still finished 13th!!) 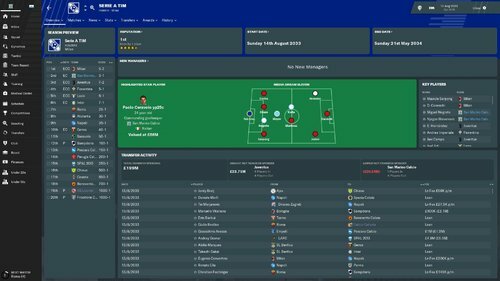 I managed to get Lafont for £2.5m. He's a significant upgrade, even if I do feel badly considering Grabara kept 28 clean sheets this season. Hey, when a player of his calibre is available for pittance, you go for him!! In fairness, we have a fair amount of decent youth in the squad, so I'll be throwing them in for plenty of game time next season, especially as we don't have a huge transfer budget. And an honourable mention to Maurizio Albani. 49 apps, 24 goals, of which 17 of those were in the league. Not bad for our 19 year old prodigy. 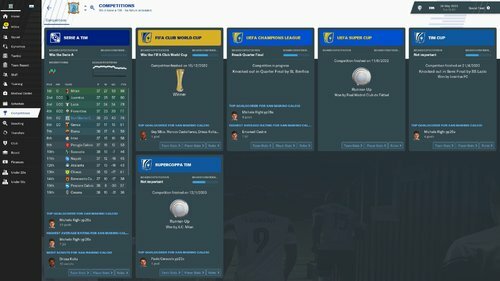 Despite finishing third, this was a pretty terrible season. We have a good squad now and should be challenging for the title, not scrambling for CL qualification. None of our players really performed and there were some quite horrible results despite hammering teams on paper. It's safe to say the new stadium hasn't helped with only 3/12 wins since moving in. We navigated our way through our CL group with ease but pulled Chelsea in the first knockout round and lost 3-1 on aggregate. Again, woeful in the Italian Cup. We lost in the first round at home to Fiorentina. I think we've only got through this round once or twice since the beginning of the challenge! Roma. 0 points. 8-3 on aggregate. It's getting annoying now. At least they didn't win the league. We're nearly there in terms of upgrades. Only training and youth facilities to be upgraded before we have a perfect set up all round. We're not selling out our 17,069 seater stadium yet, so I'm holding off asking for expansion until we're close. Finances are very good now. 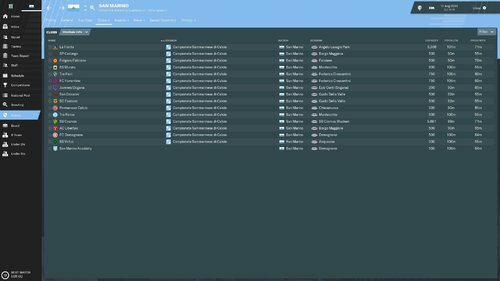 We're classed as rich and I have a healthy transfer budget of £44.5m to spend next year (although I doubt I'll spend anywhere near that). Probably the worst intake I've had overall. We did have one good player come through who goes straight into the national team, but the rest were tripe. I really want to win the league. Top four is the only thing I'd usually want, but after the s**t I had to endure last season I really want to come out on top. 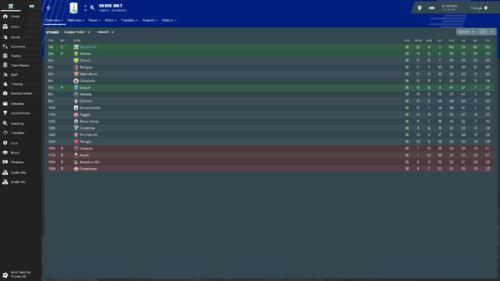 QF of the Champions League would be nice, but I'm not sure we'll compete if we get through our group again. 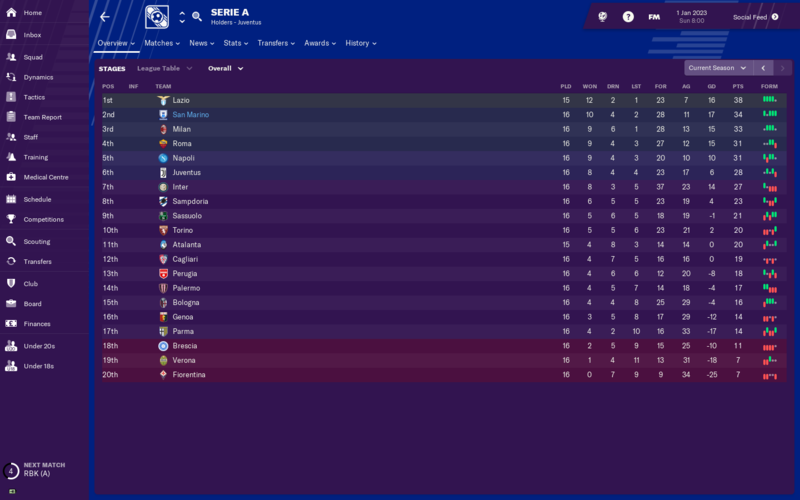 I wouldn't be too disappointed to finish third and have a run in the Europa League. 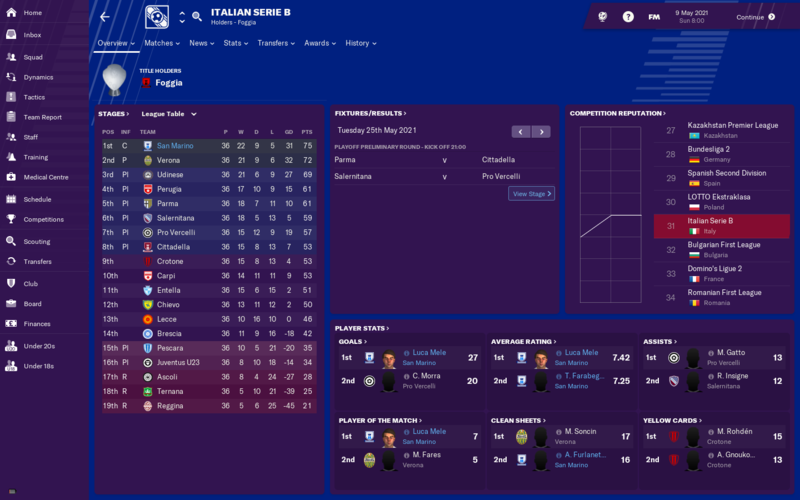 I want to win the Italian Cup too, I'm sick of getting knocked out early. Finally, something to shout about! We topped our International League! 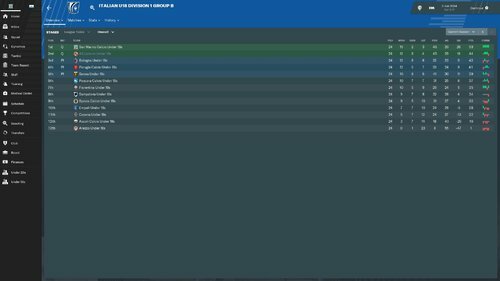 Nicely done with the national side, correct me if im wrong but i think 2026 is a world cup year though, so dont think you will get a Euro's play off spot. I feel your pain Italian cup wise, im 16 seasons in and yet to win it. Only thing that hasnt been won club wise . 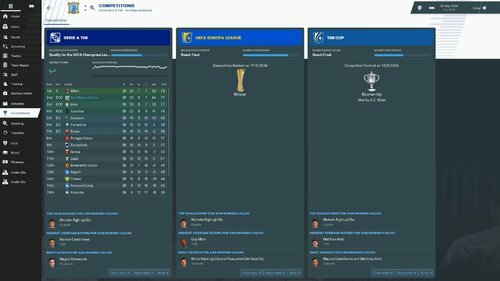 A rather boring season, to be honest, it was a tough battle to stay out of the relegation playoffs but we made it with two games to spare. An impressive Nations League led to us finishing second in the group, but a late collapse against Wales cost us a world cup qualifier win. Congrats Skidz1892, looks like things are going well for you! Do you have a shot of Maurizio Albani, he sounds like he's quite a player? 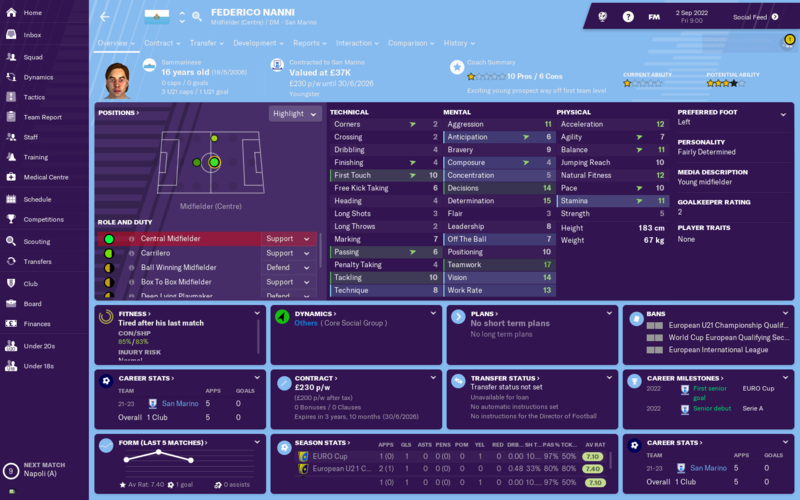 Is he Sammarinese? Enjoy the extra Champions League money next season. Yeah its been a really enjoyable part for me too. 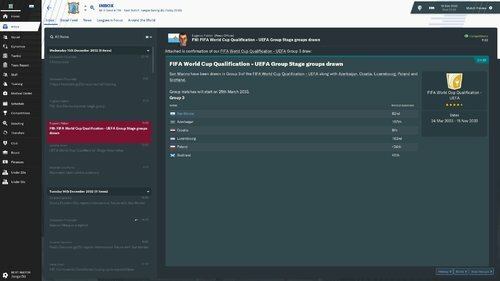 Taking over all 3 squads for the next round of qualification will be a slog at times, but im hoping it works in my favour. This is the most important day in any save of this kind, and this year we have been blessed with a really decent intake. Some of you might be thinking its a pretty average intake, which it is, depending on how you look at it. Alot of intakes have consisted of mainly Italian players, which is frustrating, this one however, consists of just 1 player not eligible for San Marino. And with 6 players rated at 2.5* P.A, this could be a really important intake, you might be thinking 2.5* is not really that good, but it equates to a decent Serie A player, which would still be decent as back up options for the national team. 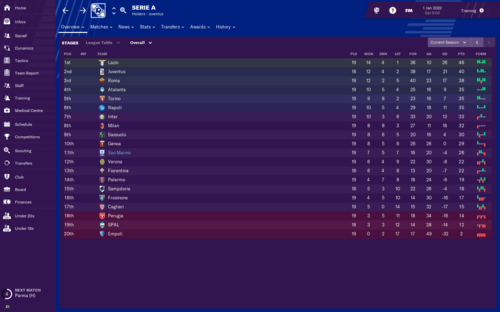 The aim was to get back into the top 4 after last seasons complete blow out, and we managed to finish 2nd, taking the title to the last 2 games. I am very happy with this as we haven't signed anyone (minus 2 ex youth products) for the last 3 seasons. 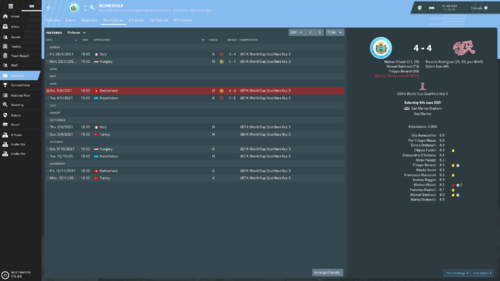 We had a head start on a full blown youth save, but winning the title is proving difficult enough this way. Milan are a real quality side, and will take some topping. In the Europa League we played mainly 2nd choice players, and just kept winning, admittedly I played the big boys in the semi's and Final, and we managed to win a maiden Europa League. The TIM Cup was again a failure, getting all the way to the final, only to lose to Milan, being 1-0 up in the 92 minute makes it hurt all the more. That's now 16 seasons without winning it, I am seriously thinking we never will. 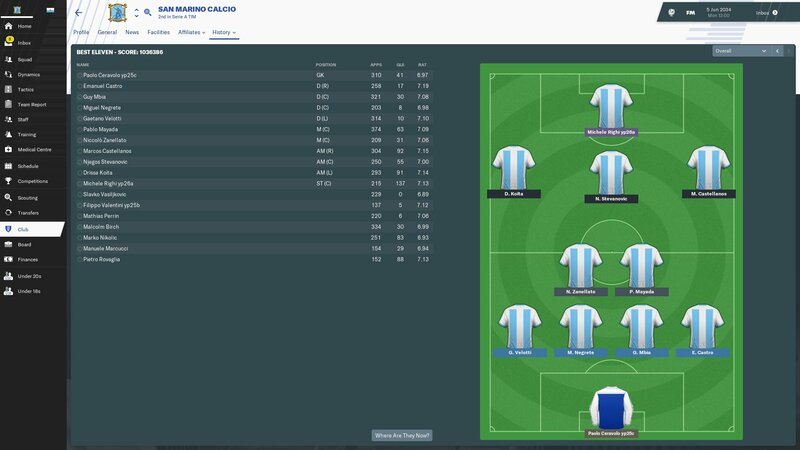 We now have 12 HG Players in and around the first team picture, and that is only going to increase from now on until we have a full squad of just HG players. It wont be for a few years yet as I need to stay competitive aswel as bring through youth products. You will also see fron the overall best 11 that GK Paolo Ceravola 25c is now on a very impressive 41 career goals. At the age of just 25, I am really hoping I can get him to the 100 club. Moretti 20b was bought back to the club, he was sat on Napoli's bench so thought rather mine than theirs. 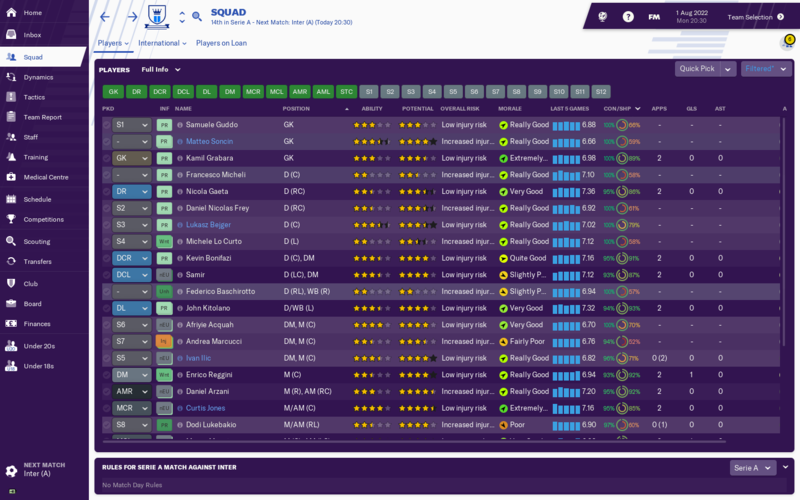 Other than that no signings, and just squad players moved on. 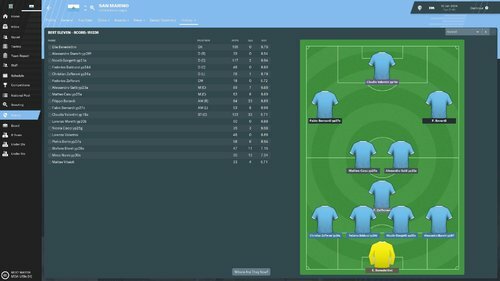 After suffering relegation to Division 2 last season, I took over for this campaign, and we was way too strong for the opposition. 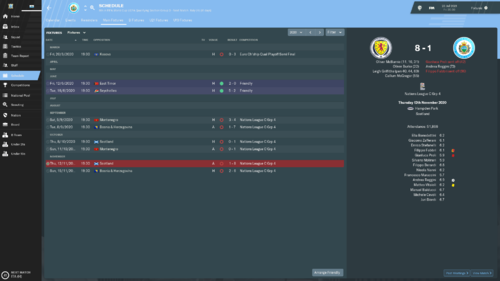 I am going to stay in charge for next season, and see if we can land a maiden u20s title. 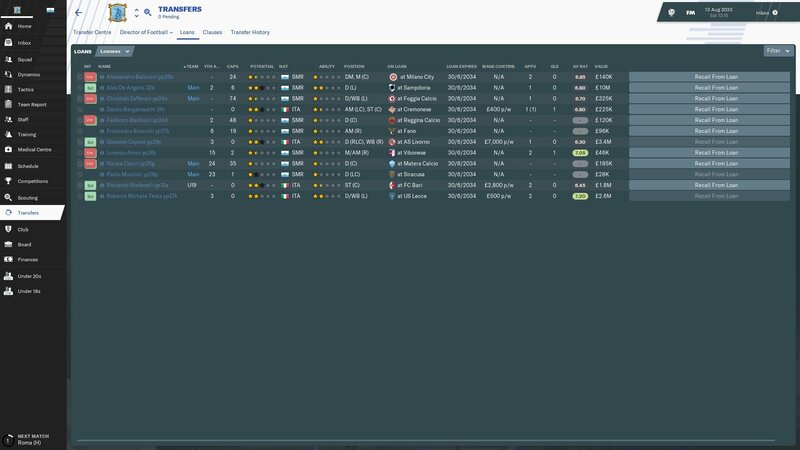 I have former Atletico centre back Jose Gimenez in charge of our u18 side, and in his first season in charge, they have been immense. I took a punt on him, as his stats are not amazing, but with a perfectionist personality, I thought he may do well. 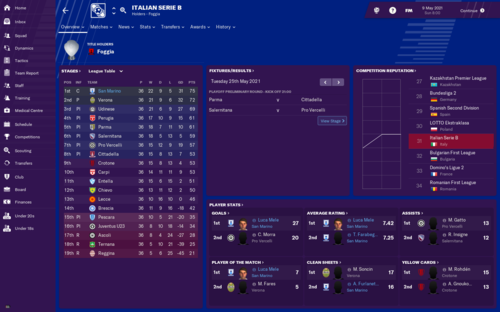 They managed to win the league comfortably, and get to the play off final, losing 1-0 to lazio u18s. 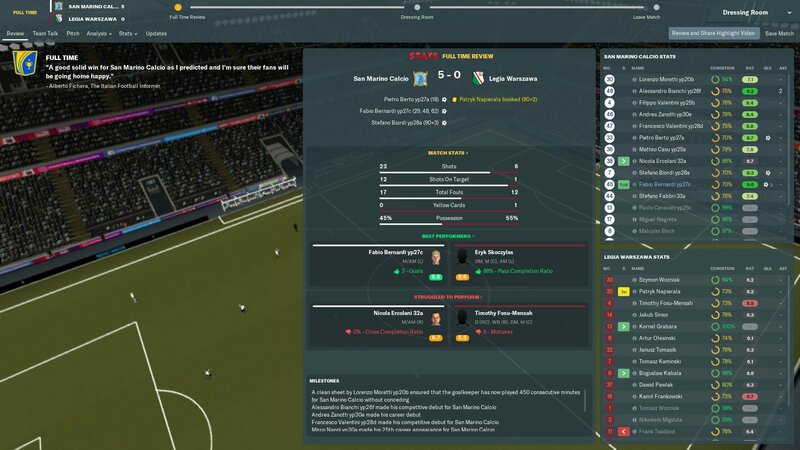 Thats the 2nd time we have lost in the final, as we await our first ever trophy at youth level. 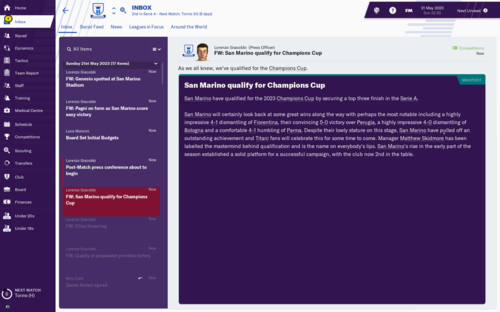 We need top 4 at the very least, having won a few league titles, Im not too bothered about winning it again until we have just HG players in the squad, my main focus will be with the youth sides, ensuring all Sammarinese players are being given sufficient playing time in order to maximise any potential. 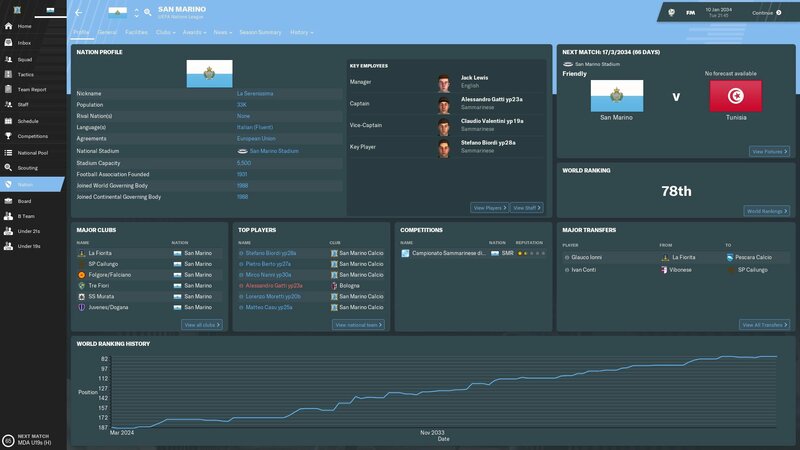 Being in charge of all 3 National sides, (Senior, u21s and u19s) I am going to need all players at every level match fit to realistically break the habit and get qualified for a major tournament at any level. I am also aiming to win the u20s Division 1 title and don't think it is too unrealistic a aim. I'm interested in giving managing San Marino a go, but I'd like to do it as part of an ongoing save I have, so I haven't ticked to include all the Sammarinese players. If I used an in-game editor to change the nationality of a bunch of players, would it be possible to unlock that option (and how many would I need to change if it is possible)? Never known anyone to do it that way. Not sure its possible without ticking that option at the start of the game, but im no expert. @RexEverything try downloading the Klaassen patch for the San Marino league. That's the only way that I can think of to increase your chances, but like @Lewis89says, I've only known people to start the challenge from scratch, and not mid-game. @robredo87 thanks dude. there are definitely better strikers out there, but no better Sammarinese strikers!! He fits well into my ethos as well, so that's a plus!! These three are the highest potential Sammarinese players that I have (and for the whole National Team).